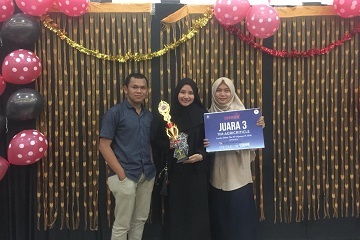 Another achievement was obtained by three students who are members of the Agricriticle Team of Bogor Agricultural University (IPB) in the Hipotex R Debate 2018 competition. This competition was an event held by the Professional Association of the Economic Science (Hipotesa) of IPB last September. After going through various stages of selection, the IPB delegation finally won third place in this competition. The team consisted of three students from different majors, namely Habibul Fuadi Hanif (Department of Mechanical and Biosystem Engineering), Ilhamda El Zuhri (Department of Communication and Community Development), and Futiha Hikmatul Husna (Department of Biochemistry). This competition was an annual event that is quite prestigious and in great demand by students in Indonesia. These three IPB delegations are indeed not from the economic field, so it was necessary for them to learn materials related to the national and global economy as well as economic development. To become a winner in this debate competition, they must compete with teams from other universities in Indonesia. This debate competition was quite tight. Before going to the debate phase, applicants were required to provide critical solutions to case studies and economic problems. Next, the top eight teams were chosen and eligible to participate in the debate competition. Starting from the elimination to the semifinal rounds, they were faced with teams that qualified for the last eight. Most participants of this debate competition were students of business or marketing departments. "We were very enthusiastic in participating in this competition. Before going to the debate stage, each registrant team is required to solve questions related to economic issues, development economics, and the global economy, namely exports and imports. "It was great when our team qualified for the last eight and Alhamdulillah, we were able to become the winner," said Habibul. Voicing arguments and solutions in this competition was certainly a challenge for all three of them. Ilhamda or familiarly called Iin also added that this debate competition was very interesting. In the first round, they managed to beat the team from the University of Indonesia, then in the second round the IPB team managed to win against the team from Airlangga University B, but in the third round they were defeated by Airlangga University B team, thus, we won third place.